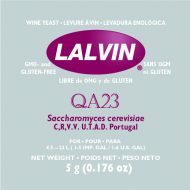 Lalvin QA23, selected on soil types from the area of the appelation of Vinhos Verdes in Portuga offers qualities of fermentive security bound to a weak demand in assimilable nitrogen and O2. Lalvin QA23 is an excellent choice for wine styles like Chardonnay, Sauvignon Blanc, Sémillon, Chardonel and Gewürstraminer. Capable of fermenting juice at low temperatures (15°C/59°F) to dryness.